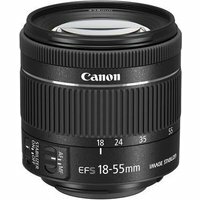 With a weight of just 215g, the Canon EF-S 18-55mm f4-5.6 IS STM Lens is a compact, standard zoom lens thats suitable for general purpose photography. It features a 4-stop image stabilisation system to prevent blur caused by camera shake, and a Stepper Motor (STM) autofocus for fast and quiet focusing. Its Super-Spectra Coating reduces flare and ghosting, delivering high-quality, clear images.